Please take notice that we put this place first on the bullet list. As in, your best shot at a successful evening is to go here before you make your rounds getting loaded on beer and/or margaritas. Shoot, just wanted to point that out. Ugh. Red’s Indoor Range is the best place in town to get ice cream. We kid, we kid. It’s exactly what it sounds like: Walk inside, choose a gun, get a way-too-fast explanation of how to use said gun, pick up some ammo and earmuffs, and shoot your little heart out. Just be careful – these are guns, dude. This place can get a little pricey, so watch what you spend if you’re on a budget. Getting there can be a little tricky, so pay attention. From I-35, head west on 290/71. Keep going west past MoPac toward Oak Hill. Just when the highway starts turning into a road, you’ll see a pawn shop on the right side. You’re close! 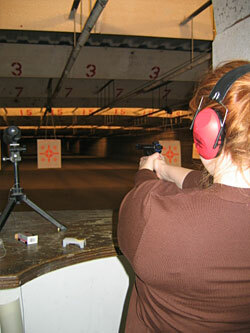 Look for the Red’s Indoor Range sign – it’ll be a sharp right once the highway lanes merge to one lane. Make a right on West Gate Boulevard, and Madam Mam’s is almost immediately on the right. Make a right on West Gate Boulvard, then make the first left into the shopping center. Drive straight ahead and you’ll see CM. Central Market Cafe is on the east end of the store. “A two-step above the rest,” the 2,000 square foot dance floor at Midnight Rodeo is the perfect place to show off your smooth moves, cowpoke. Down a few $1 longnecks (on Friday nights) or $2.50 MGD and Miller Lites (on Saturday nights), and you’ll probably be all about dancing. Warning: There might be a cover, but you can call ahead to find out. To get there from West Gate, head east on 290/71. You’ll see it on the right side just after you pass I-35, so you might just want to stay on the access road. If you hit Burleson Road/Todd Lane, you’ve gone too far. There are drink specials at the Warehouse every night of the week, so you’ll have some cash left to play pool on one of their sweet tables. On Saturday nights, karaoke hosted by some guy named Robert Wagner starts at 10pm, so you’ll show up just in time to get a great seat (and a parking spot). Stay on the access road and head east on 290/71. The Warehouse is on the right side just after S. Congress. If you hit I-35, you’ve gone too far.